CMS Danskin Acoustics offer a wide range of Resilient Acoustic Floor Coverings, including the Regupol range: Regupol 4515 Multi, Regupol 4515 Eco, Regupol 3912 and High Impact Mat. Our range of high-performing yet cost-effective resilient acoustic floor coverings are quick and easy to install, compatible with all types of sub-floor (beam and block, pre-cast concrete, timber) and, in most cases, can be used under carpet, vinyl, parquet and tiled floor finishes. Each of our products has been developed with a particular application or range of applications in mind. To this end a variety of materials have been used, including PUR foam, recycled rubber and cork. 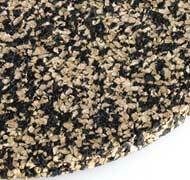 *Regupol 4515 Eco is manufactured from a combination of cork granules and rubber crumb. The manufacturing process of this product results in the presence of carbon black fillers, which can cause plasticizer migration; the discolouration of light coloured floor finished such as vinyls and carpets. To avoid such potential problems, we strongly recommend the CMS Bond 100 Adhesive be used. Please contact CMS Danskin technical services, if light colours are being used, for full range of floor finishes and if you require a list of recommended adhesives. ** Regupol 3912 is only suitable for use with lino/vinyl if an overlay of T&G Chipboard (minimum 18mm) is applied.